Our simple approach is to convert waste-to-resource with onsite bioenergy solutions. Minimizing the export of “waste” just makes so much sense – especially when you can generate clean renewable energy and recover water, nutrients, organic matter/carbon and beneficial microbes from it. Conserve resources, build healthy soil, avoid importing to your site and costs. The primary barrier has been the lack of scalable technology and the belief that economy of scale at distant facilities trumps onsite material recycling. We know that is not true where hauling, tipping fees, fuel, and energy rates are significant expenses. We offer a basket of technologies for food and beverage “waste,” landscape “waste,” wood “waste,” packaged unsalable food, and fats. They are designed to serve food and beverage sectors, commercial, industrial, institutional, and residential communities of 100 to 50,000 people. They are designed to make the very best use of materials and to return as much carbon to the soil as possible. This propels the cycle of organic and renewable resource generation hyperlocally. 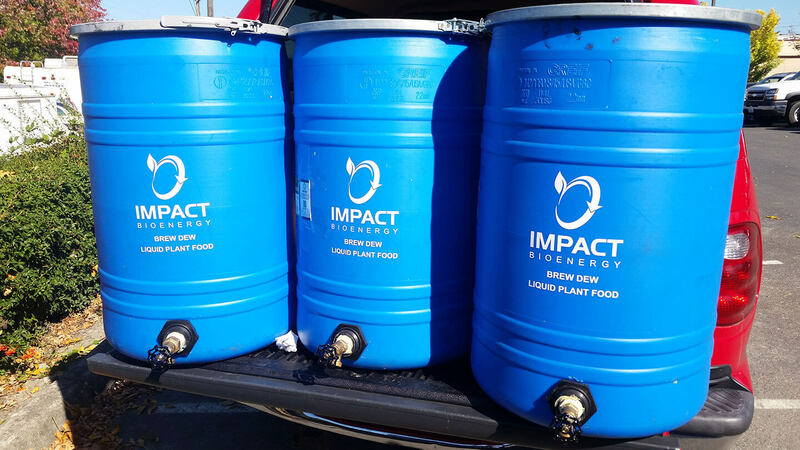 Let’s unpack that basket of Portable and Onsite Technologies Offered by Impact Bioenergy™. Portable Bioenergy Systems like the AD 185 (185 tons/year) rated for 0.5 tons per day input capacity. Output can be 11.7 to 35 kW depending upon gas storage and energy consumption patterns. Three phase CSTR + Fixed Film Pumpable Systems like the AD 1000 and AD 5500 (1000 and 5,500 tons/year) rated at 3.0 and 15 tons per day input capacity. The systems feature extended residence times to manage irregular feed rates, acids, alkalinity, and to insure consistent gas production. The systems include solids dewatering and CHP or RNG upgrading with vehicle filling equipment. Alternating High Solids Batch Tunnel Systems are available through our cooperation with Turning Earth and Aikan Technology. The capacity is scalable in terms of tunnel size and number of tunnels. 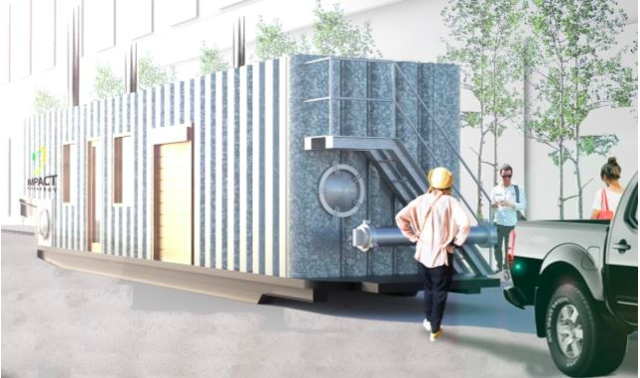 This is a hybrid high solids batch technology that can quickly process food, landscape, wood, cardboard, biosolids, and manure in a single step. It is tolerant of contaminants and integrates anaerobic digestion and composting in a single tunnel without moving the feedstock. Subterranean Alternating Systems are available and ideal for resorts, parks, islands, and farms that need a low-cost system with longer residence time of 6 to 12 months. The standard capacity is 2,600 tons per batch, but this is scalable up and down to as small as 500 tons per batch. This technology is quick to construct. This is a hybrid high solids batch technology that can slowly process food, landscape, wood, cardboard, biosolids, and manure in a single step. It is tolerant of contaminants and integrates anaerobic digestion and composting in a single vessel without moving the feedstock. Engineered gas holder covers and gas storage systems are available through our cooperation with Sattler Ceno Tec. Storage capacities from 50 to 6,380 cubic meters (1,760 to 224,500 cubic feet) are available. 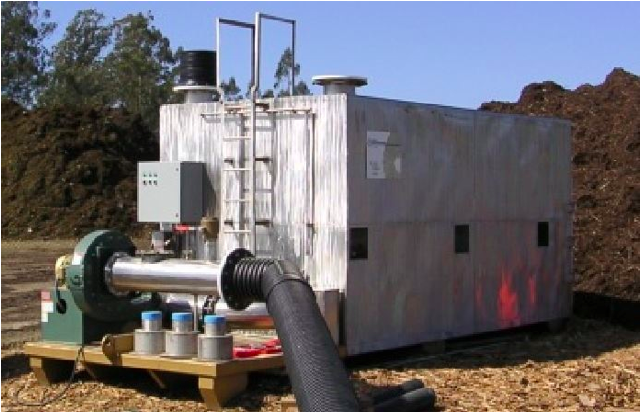 These systems store, measure, and regulate biogas to compensate for fluctuations in production and consumption. The ideal storage volume and configuration varies for each specific digester design and operation. There are double membranes, various pressures, various sizes, as well as wall or ground connections. Sattler has a number of patented mountings, openings, pressure and vacuum controls, and measurement systems. Bunker Style Composting is available with pre-fabricated skid-mounted mechanical systems. Capacity is highly scalable as the bunker size, number of bunkers, residence time, and pile height are all adjustable. Configurations include a simple three-sided building, a full building with doors on each bunker, or a hall-style building with enclosed feedstock preparation and handling inside the building. The composting is typically dual direction, with alternating positive or negative aeration and exhaust biofiltration. Additional odor control can be added such as biocarbon filtration, counteractant atomization, and exhaust stack discharge. In-Kitchen High Speed Systems are available through our cooperation with CityPod by Vertal. Capacities range from 720 to 5,850 lbs. per week input capacity. 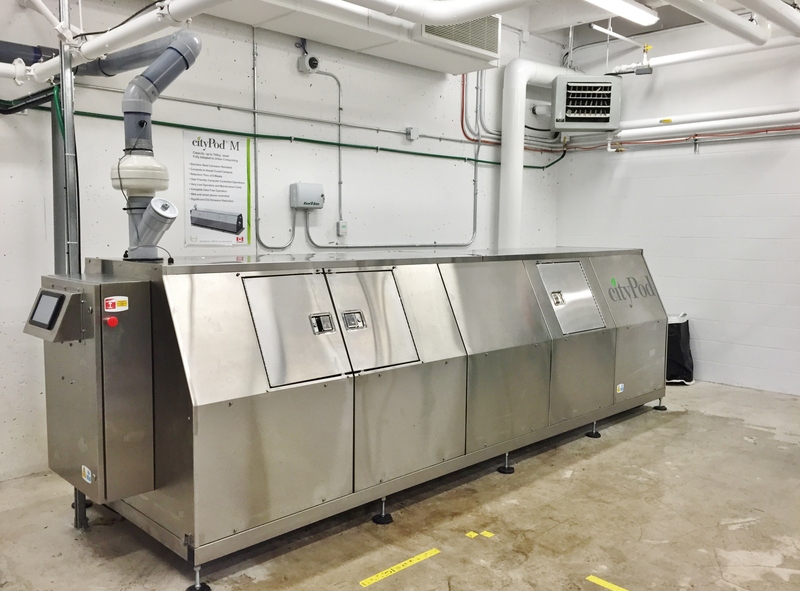 These stainless steel systems are designed and built to be located inside or just outside food preparation kitchens to quickly convert kitchen trim and post-consumer dining room foodwaste into compost onsite. They require a small physical footprint and can significantly reduce the carbon footprint involved in foodservice operations. 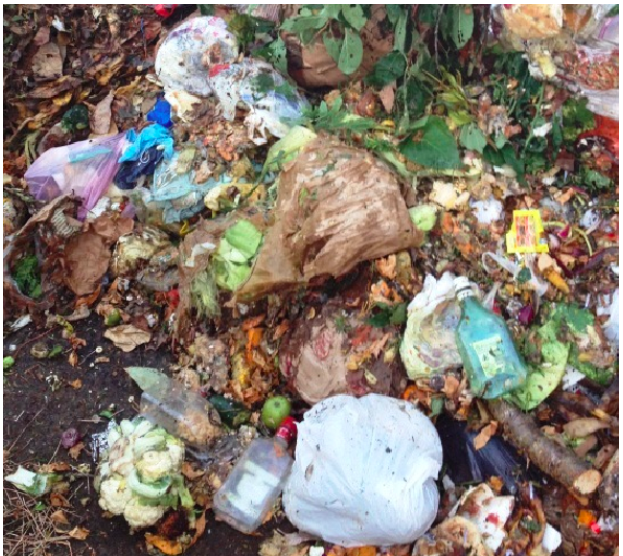 These systems not only deliver a zerowaste solution but frequently solve odor, insect, rodent, leakage, and bird problems associated with food dumpsters. Portable forced dual-direction aeration systems without enclosures are available to bring robust process control without the cost and delay of constructing pavement, enclosures, and buildings. Capacities can be 0.7 to 100 tons per day. 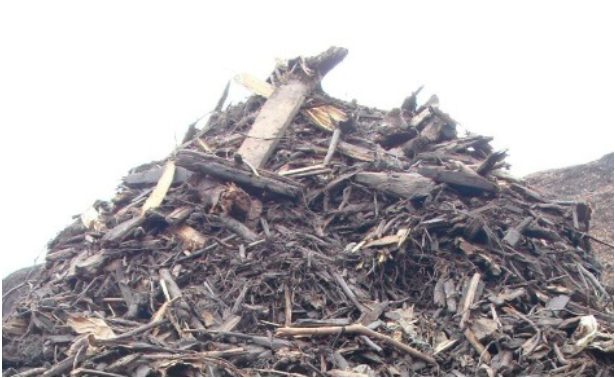 Single batches can be scaled down to 50 cubic yards per pile. 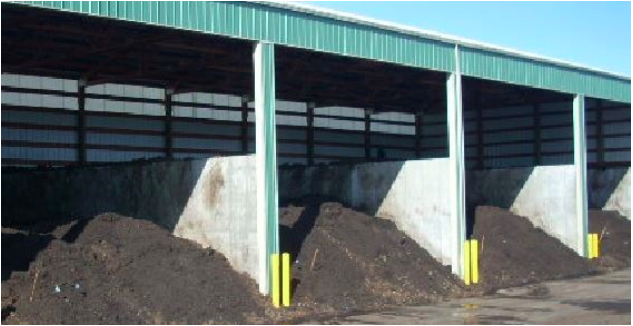 These systems are low cost but deliver high-speed aerated static pile composting with odor control. Assembly can be in a single day. Rotating drum systems are available through our cooperation with Daritech. Rotating drums are available in sizes ranging from 5 feet diameter x 14 feet long to 8 feet diameter x 40 feet long and can dramatically accelerate composting so curing can occur in static piles with better odor control. Capacities can be up to 13 tons per day. 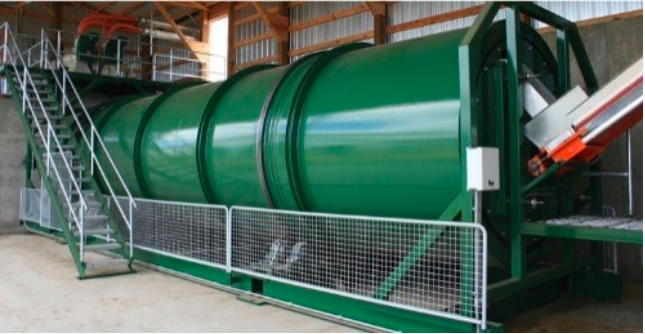 These systems are ideal for blending high-moisture, high odor-potential feedstocks with high-carbon amendments to properly manage and accelerate the composting process. 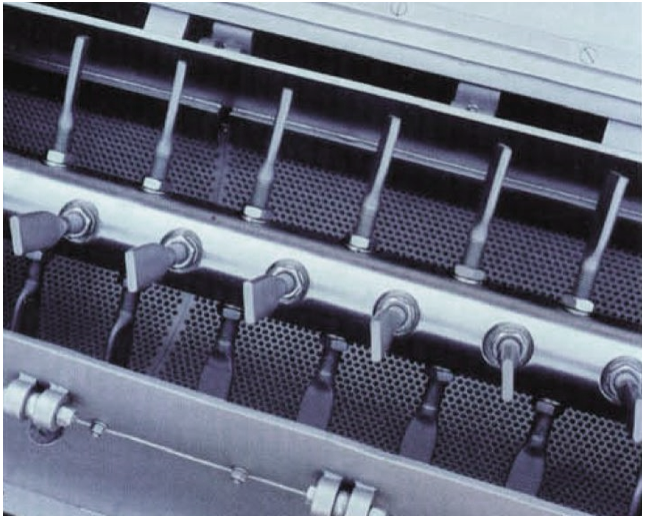 They can also reduce the size of forced aeration by serving as a first stage and advancing the feedstock decomposition so forced aeration residence times are shorter. Mechanized mass bed systems are available through our cooperation with Green Mountain Technologies. These very small footprint systems are continuously fed (vs. batch operation) and are mechanized to agitate and advance the compost through the system. They are available in capacities from 0.5 to 3.0 tons per day. The systems are ideal for composting daily amounts continuously and blending wet and dry materials effectively. The system is enclosed for odor control and is typically designed to accelerate composting so curing can occur in static piles with better odor control. In some agricultural situations the composted output may be stable enough to use or distribute directly from the system. Portable continuous systems are available for processing approximately 2 cubic feet of clean, dry wood per hour in a proprietary two-stage process. 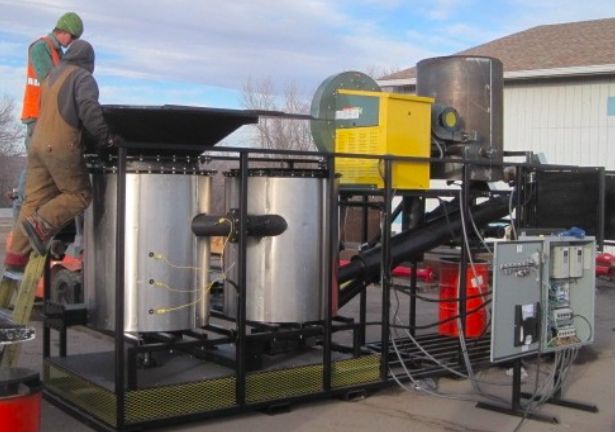 The production equipment optimizes biochar for characteristics fixed carbon and high surface area, through exothermic production. Wood or other carbon-based feedstocks can be between 3/8” and 4” sizing, and should be free of dirt, rocks, other inerts, and fines. In the first stage of the process, the material is carbonized in a controlled aerobic (O2 limited) environment at a temperature between 500-700 °C for less than one minute. In the second stage, material is held in a hot gas environment for up to fourteen minutes at a temperature between 300-550 °C before the material is removed from the process and cooled. Two size fractions of biochar are produced: approximately 80% of material is in 4” X 1.25” pieces, and approximately 20% of the material is a fine dust fraction on the order of 10s to 100s of microns. Large-scale batch retort systems are also available by custom design. 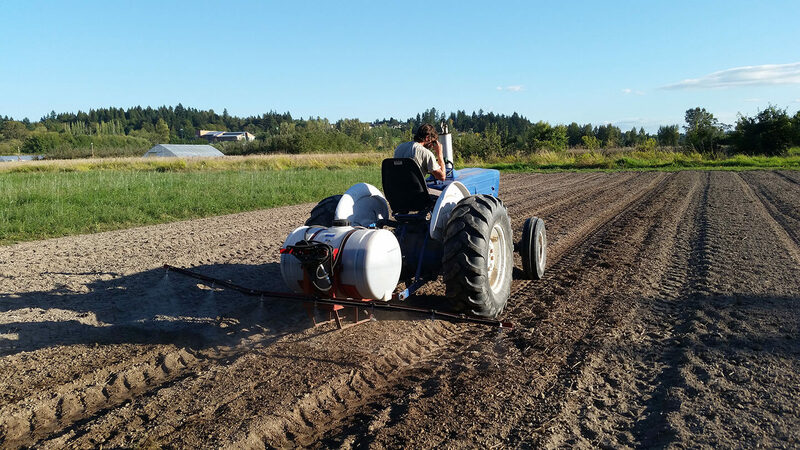 We are happy to consult on larger projects to insure the feedstock, contaminant control, moisture, control, biochar characteristics, producer gas system, and emission control meets project specification. Hot Air Systems are available through our cooperation with Pronto Bioenergy Solutions. They run on dry wood chips or pellets and can generate up to 130 C (265 F) warm air out outlet temperature. These patented systems are modular, clean burning, with few moving parts, showing very low wear, easy to use, and have extremely long run times. 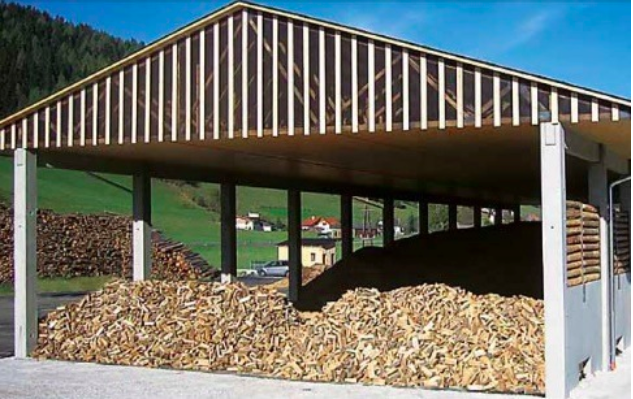 The wood silos can be easily refilled by various means. Capacities range from 14.9 kW to 750 kW (50,800 to 2,560,000 BTU/hour) nominal heat output. Airflows range from 900 to 25,000 cubic meters per hour (530 to 14,700 cubic feet per minute, cfm). Hot Water Systems through our cooperation with Pronto Bioenergy Solutions, that run on whole cordwood, chips, pellets, shells, pits, and similar dry materials, and generate 90 C (194 F) hot water. The systems range in size from 23 kW to 2,000 kW (78,500 to 6,830,000 BTU/hour). The simple control systems can be managed remotely. Solar energy pre-heaters are available is an integrated system. Automatically fed fireplaces are available. A fully containerized, drop-in system is available as well, configured in an intermodal shipping unit. Bulk Drying Systems through our cooperation with Pronto Bioenergy Solutions, include dehumidifiers and forced aeration plenums for bulk material drying. Drying significantly increases the heating value of woody fuels. Aerated pavement or above grade piping are possible. Automated control systems are available, which measure and regulate according to dew point, run time, saturation deficit of the air, humidity, and water quantity to remove. 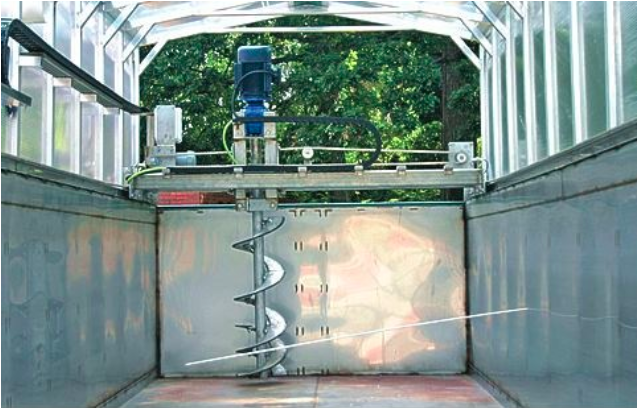 Carbon-based fuel materials as well as forage crops like hay can be dried with these systems. Product destruction systems to de-package unsalable food or other organics and beverages are available to divert packaged food away from disposal. Capacities vary depending upon the container type and food consistency, but separation rates typically range from 1 to 40 tons per hour over a family of six machine sizes. Foods and liquids are separated for digestion or composting, and the remaining plastic, glass, metal, cardboard, and other materials are separated for recycling. Packaging and contaminant removal from organics source separation programs are available to address the growing need for plastic and trash contamination removal from digestion and composting feedstocks. Systems are tailored to each project specification and may include shredding, centrifugal separation, compression, screening, heating, and drying. We are happy to listen to your needs so we can design the best possible system. 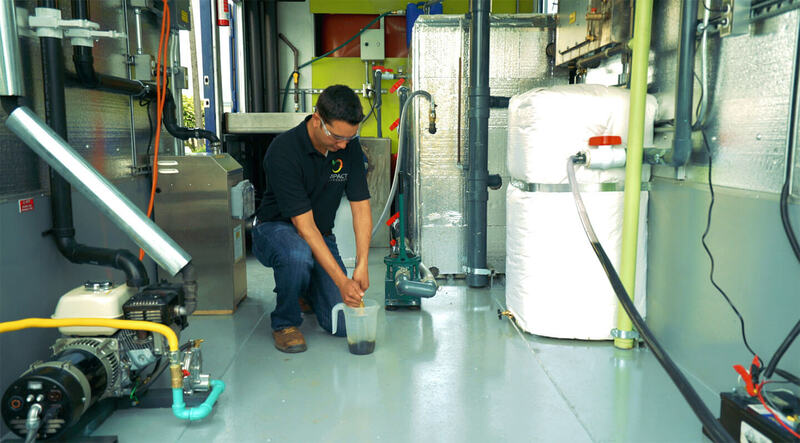 Dried digestate, finished compost, cellulose, and other carbon-based products can be pelletized prilled, or briquetted for more efficient storage, transport, marketing, and application. Moisture levels are typically below 10% and material volumes and weights are minimized which further improve efficiency. We can help bring your products and co-products into higher value markets by processing into low-moisture products like pellets, prill, and briquettes. Animal and vegetable fat conversion systems are available in a variety of sizes and capabilities. We feature 5 to 20 gallon per minute systems using skid mounted equipment that has a pre-treatment approach to deal with each type of waste fat or oil and free fatty acid content. Glycerin, extracted water, and particulates can be used in digestion to take full advantage of the technology synergies. Copyright 2019 Impact Bioenergy. Proudly manufactured in Auburn, Washington, United States. 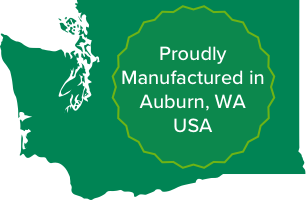 Proudly manufactured in Auburn, Washington, United States.